The CEL633C1 is available for hire over a period of one week or longer. This is a top specification meter that is ideal for environmental noise surveys and exceeds the requirements for occupational noise measurement too. The CEL633C1 is the top of the range meter and is fitted with all options, such as octave and 1/3 octave band filters, detailed data logging with time history plots, and environmental noise measurement parameters. This meter also has the Audio Recording feature fitted, making the positive identification of a noise source much easier - you listen to it! It is essential that a sound level meter meets the correct standards for the measurements you intend to make. Most regulations will indicate the type and grade of meter to use. As the CEL633C1 is a Class 1 (the most accurate version) to IEC 61672 and Type 1 to ANSI S1.43, it is an Integrating meter and fitted with 1/3 octave band filters, it is ideal for most applications. This comes complete with data logging, providing a detailed graph of the sound level over time. 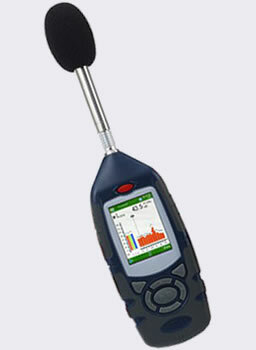 It also measures the required environmental noise parameters, such as periodic LAeq, LAmax and Ln statistical values. Automatic timers can be used to make repeating measurements. Many regulations require repeating measurements of 5 minute, 15 minute or hourly duration. As this is a Class 1 Integrating Sound Level Meter, it exceeds the requirements for noise at work assessments. If you need to measure both noise outside and inside the factory then this meter is ideal. For pure noise at work measurements, the lower cost CEL620B2 Integrating Sound Level Meter is more cost effective. Many regulations state that the meter's function should be checked before starting measurement. Put the Calibrator on the mic. and select the Calibrate option to do this automatically. Press the Run/Stop key to carry out a manual measurement. Otherwise, use the timers to make 15 minute measurements for example. All parameters are stored in the meter for viewing or download - no need to choose which measurements you need, they are all there. Back in the office, the measurements can be viewed on the meter's display or they can be downloaded to a computer. The hire kit includes the Insight software for downloading and reporting. If you prefer to create your own reports then the noise measurements can be exported to Excel or similar software for maximum flexibility.